Formula 1 is officially back and, as for every single race weekend throughout the season, so is the Tech Highlights series, which aims to cover the most intriguing and important updates over the course of the year. Although we have only seen a handful of major updates (which you are about to read about) so far this year, expect development to start ramping up very quickly. Most of the aerodynamic modifications have been fairly subtle as teams optimise the aero package around the cooling of the 2014 power units, with substantial performance boosters to come in the near future. The Milton Keynes outfit have been incredibly busy since the final test in Bahrain, although it was no surprise to see a much tidier looking RB10 in Australia. The well documented issues surrounding the Renault power unit have ultimately cost them time in developing the aerodynamics of the car further, but we finally saw a much more sophisticated rear end during Friday practice. The central rear wing support pylon (highlighted) has been tweaked slightly and integrates a little more elegantly with the spine of the engine cover. The rudder-like trailing edge shape helps maintain rear end stability in yaw, despite the additional surface area presented to the airflow. 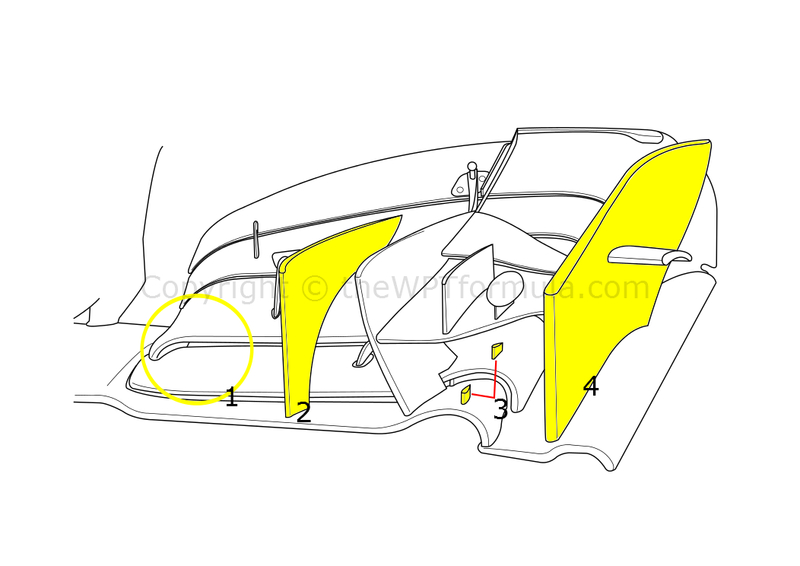 The main attention seeking addition, however, was the introduction of three slots in the rear wing endplate. Traditionally, louvres (also known as gills) are placed in the endplate above the rear wing’s profile to bleed high pressure airflow (passing over the wing) out into the ambient pressure region outside of the endplate. This is to reduce the build up of large vortices at the wing tips where the high and low pressure (flowing beneath the wing) flows meet, as the louvres reduce the pressure gradient between the upper and lower surfaces. This reduces drag but also slightly decreases downforce. 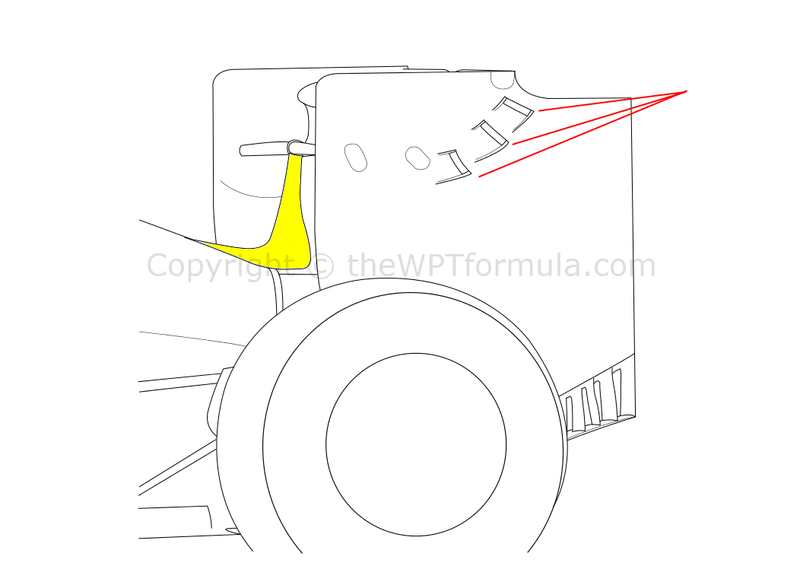 I explain this in a little more depth in a post specifically on rear wing endplates, here. Red Bull have bucked the trend a little by inserting inward facing slots against the lower face of the rear wing. The slots introduce higher pressure airflow into the low pressure region beneath the wing, which produces exactly the same effect as the louvres as described above but in a slightly different way. Ultimately, the disruption of the low pressure area reduces downforce more significantly with these slots when comparing their effect to the louvres. This interesting change in design philosophy could be caused by Renault’s power unit lacking a bit of punch compared to the Ferrari and in particular the Mercedes opposition, hence opting for a more efficient way of dumping drag. Changes to the rear of the RB10 also included the addition of a somewhat unconvincing Y100 (Monkey Seat) winglet that was run in Bahrain. The winglet is attached very closely to the rear crash structure (far below the high exhaust position on the Red Bull) which is interesting considering that most teams have opted to exploit the high energy exhaust gases exiting beneath the winglet to generate upwash. It could well be fed by quite high energy airflow due to the undercut in the car’s bodywork along the engine cover, although I am still a little miffed by its position. Finally, Red Bull have incorporated a “mini diffuser” at the base of the diffuser, adding five pairs of strakes to aid flow stability. 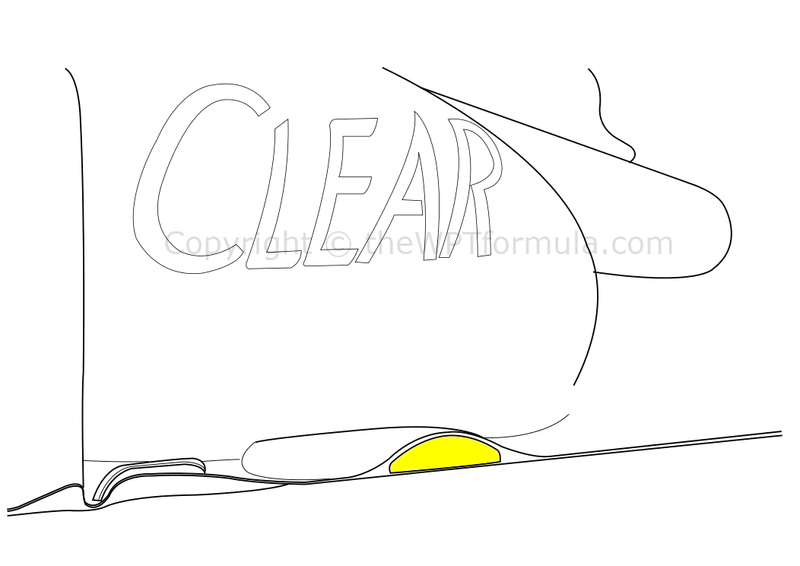 This change has come about due to the loss of the ability to blow the upward sloping central section via the starter motor hole, as the teams have to either cover it with hinged metal flap or do what Mercedes have done and create a unique hole that must not be visible from beneath the car (see my ‘u’ bend diffuser hole analysis on richlandf1.com for further information). 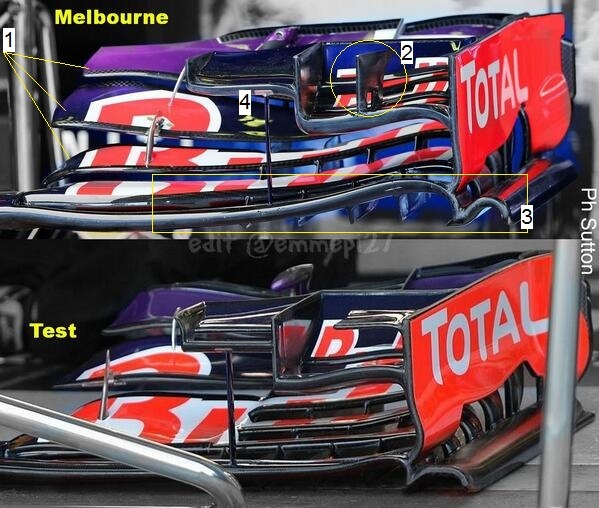 A substantial treatment to the front wing was also evident in Melbourne as the team continue to evolve the ever increasing complexity of the modern front wing. The wing is now split into 5 elements across its width (1) although the total number of elements remains at 6. I’m probably wrong when I say this, but I believe the wider spacings allow the wing to operate better at lower speeds because airflow beneath the wing will remain attached as more air is allowed to bleed beneath the wing. This is at a cost of peak downforce at high speed, but a consistent front end will be more of a blessing to the driver. A vertical vane (2) has been added to a revised triple element cascade winglet, very reminiscent of the Ferrari version with a gap, to allow airflow to transfer from one side to the other, at its base. This will further aid the outwash process that the wing induces around the front tyre. The main plane (3) has been heavily revised, with a sinuous leading edge meeting the airflow as it first passes over the car. This is coupled with a new, more rounded footplate compared to the previously squared off version. Both these changes are to encourage airflow to pass around the front tyre whilst maintaining a strong level of downforce. Finally, Red Bull have also shifted the support pylon (4) for the cascade elements slightly inboard and have also slightly tinkered the secondary, smaller winglet in the process. Coming off the back of a hopeless final test in Bahrain, Lotus always knew that Melbourne would be a struggle. Fundamentally the car looks to be well thought through, but deciding against going to the first test in Jerez (for various reasons) has meant that the other teams have left them behind. Their problems stem from the Renault power unit although it is not the hardware specifically. All teams develop their own software in conjunction with the engine supplier to optimise driveability and reliability. Whereas Red Bull (and sister team Toro Rosso) have stepped up a gear since the final test, Lotus have struggled to keep up mainly due to lack of data/knowledge. The software issues also comply with their ERS as both MGU-H and MGU-K failures on their respective cars forced them to retire around 40 laps into the race. Although the team never expected to make it to half distance, things can change very quickly as Red Bull have demonstrated. The car looks to have a lot of potential (certainly aerodynamically) so let’s see what they can do when we reach Europe. The E22 was installed with a large cooling outlet that stemmed from the base of the sidepod to the outer edge of the floor. Interestingly this only appeared on the left hand side of the car. My guess is that it is extracting heat from a variety of sources considering how low down it is, so possibly the ERS battery and radiators. There were also some extensive modifications to the rear wing endplates and frontal area of the car, including minor front wing changes and a horizontal vane added between the two tusks of their unique nose. The vane is designed to guide airflow more efficiently between the tusks, particularly in yaw, towards the leading edge of the sidepod and spliiter area. A few changes to kick off the season for the Silver Arrows as they begin their title assault. As stated in my W05 analysis, the car is full of little detail solutions that all add up to make it the fastest package on the grid at the moment. A new front wing featured substantial changes, although the team were clearly not satisified enough to race it on Sunday. 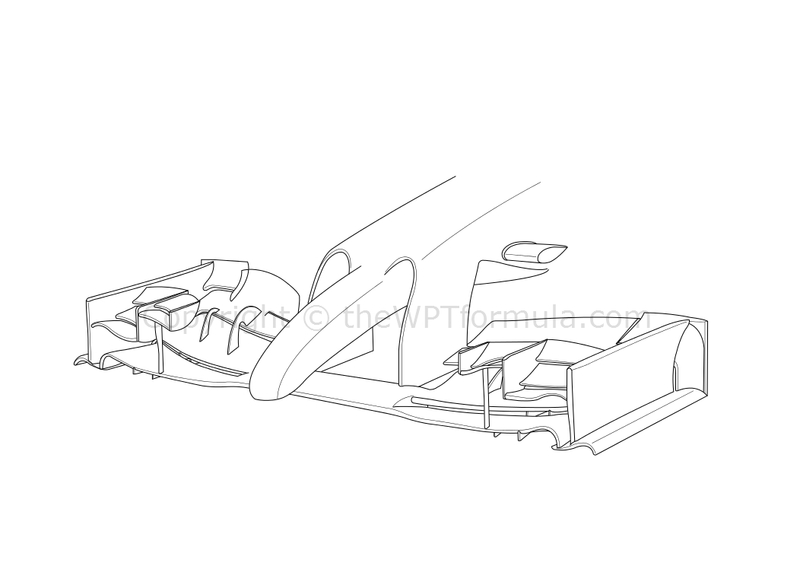 Mercedes are another team to copy Ferrari in front wing design, adopting the curled down second element of the main plane (1) at the inboard region next to the neutral central section. Its purpose is to emphasise the Y250 vortex generated in this area, creating a stronger rotating airflow along this axis of the car to deflect tyre wake away from crucial regions such as the leading edge of the floor and sidepod. A new vane (2) replaces the secondary element of the cascade winglet and small shark teeth vortex generators (3) have been installed to produce tiny vortices along the wing. These features, coupled with a single profile endplate (4) all help to push airflow around the front tyre and aid aerodynamic performance downstream. At the final test there was a new roll hoop section on the W05 that featured an additional inlet, much like its 2011 predecessor, W03. 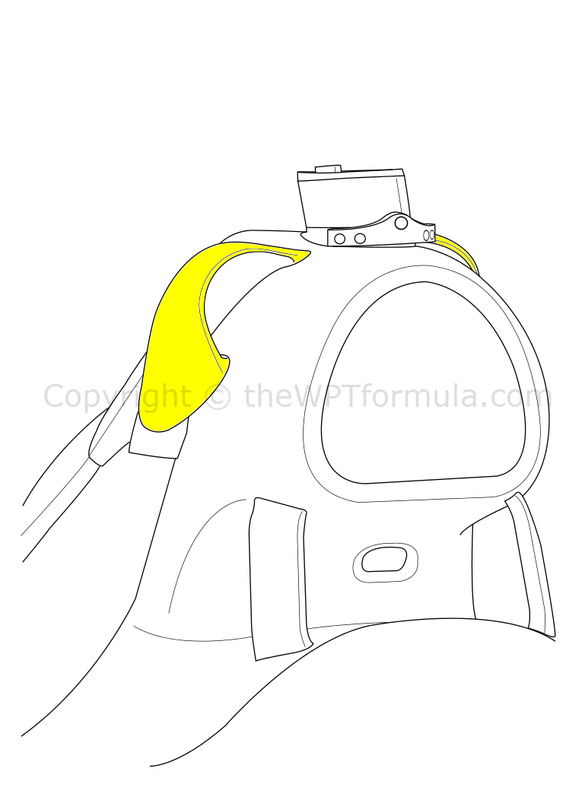 For Australia however this has been split into two “ears” which either feed cool air to the turbo unit or the gearbox oil radiator. The engine cover has featured small outlets above the turbo unit since the car’s inception so it wouldn’t surprise me if the pair of cooling devices were linked. A few rumours have suggested that a new nose was planned for the final test but it failed to pass the crash tests. It then failed its next test on the 10th March which meant that it could not be brought to Australia, either. Expect it to turn up in Malaysia. Red Bull’s sister team experimented with a ‘Y-lon’ central rear wing support in place of their floor mounted rear wing endplates, although they opted for the latter option for qualifying/race. Both nose solutions (launch version and final test specification) were run during practice, with both drivers running the higher nose from Saturday onwards. This entry was posted in 2014 Highlights, Technical Highlights and tagged 2014, Australia, bull, e22, f1, gp, highlights, lotus, melbourne, mercedes, rb10, red, tech, updates, w05 on March 19, 2014 by thewptformula. Very nice analysis, as always! I was very surprised with the mercedes wing when they came up with it (although it wasn’t used eventually). They considerably changed it, even though the launch wing was already highly detailed. Something I didn’t expect was that they dropped their signature endplate design, a concept used in the previous 2 seasons and in philosophy actually going way back to the Brawn team. I also want to note the very small timespan between the revealing of the new ferrari wing and the new mercedes wing. Either they were independently developing the very same solution (the element curling down to the neutral section), or mercedes actually managed to copy it in 2 weeks, which would be a gigantic feat.